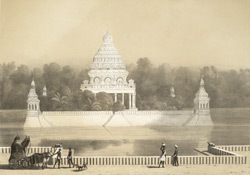 Lithograph of the The Teppakulam tank at Madurai by L.H. Rudder after the original drawing by Prince Aleksandr Mikhailovich Saltuikov of 1841 and dated 1848. The temple city of Madurai is dominated by the imposing complex of Minakshi Sundareshvara, one of the major architectural achievements of the Nayaka period. The construction of this temple was made possible by the magnificence of Tirumala Nayak (1623-1659). The rectangular precinct covers six hectares and has eleven huge towers and four entrance gopurams. Inside this enclosure there are columned mandapas, tanks, shrines and the two temples of Shiva and Minakshi. Teppakulam is situated at the eastern end of the town, about two miles from the temple. It is a large rectangular tank with an island in the middle with a small temple and pavilions at each corner. A festival is held each year at the tank where images of the goddess Minakshi and her consort Sundareshvara are placed on rafts and floated on the waters.